On this pages I give you extra information about pratical solutions and situations I’ve encountered. 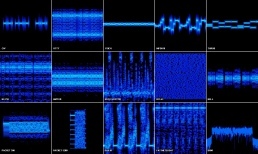 Also descriptions an situations of Equipment, hard- and Software. If you have question, Just ask me via E-mail and I will reply. Sorry, the time of big Antenna farms is over. You must find another solution. For more information, how I did it, Click on one of the pictures here below and you find my solution. Almost every Year i go on Holiday in Germany. 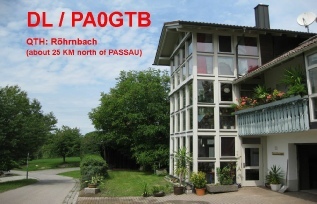 On the location where i’’m staying, i have the possibility to do some experiments on HF with Wire-antennas, which i can’t do at home anymore. Most times i do make lots of QSO’s on all HF bands. 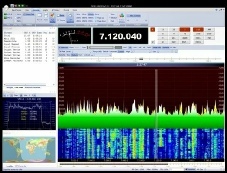 Otherwise than with Packet-Radio, was the development of nice Software Tools and programs to make use of this new modes. 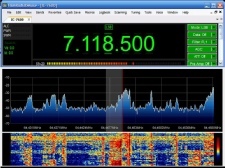 Also the Software Defined Radio (SDR) has seen the light. I’ve started to build a interface to connect the PC on the Radio. In the meantime I’ve used several programs and have done my own experience how to use these Digital Modes on Air. Click on the picture of the “Waterfall” on the Left, to go to my special Digital Modes page, and I tell you more of it. Afther doing some serious testing with the available programs, I’ve a choise. 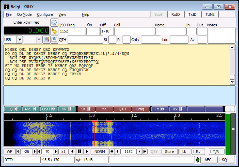 The Yaesu FTDX-3000D tranceiver has a build in Interface. You only need a USB Cable to connect with the PC. The FTDX-3000D need special settings to operate. Its not always documented easy, but at the end I found al the information I needed. For the program HRD lots of information is available on the Internet. For Fldigi you have to find out the settings for the FTDX-3000D yourself !. 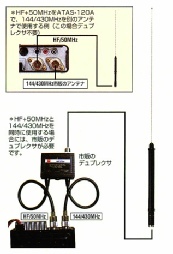 Therefore I wrote a manual special How to connect Fldigi and Yaesu FTDX-3000D for Digital Mode. As many other HAM’s I’m also a member of several Society's and User groups. Click on one of the pictures to go to this extra page.